Grocers stores in the 19th century sold an almost bewildering variety of produce: from sweets, chocolate and tobacco; to paraffin, furniture polish, tea and tinned foods. 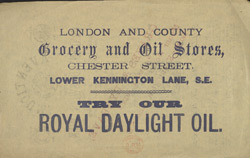 Many grocers offered a delivery service, very popular with the middle classes of the time. The goods were generally delivered by the store apprentice, who was usually a young boy.